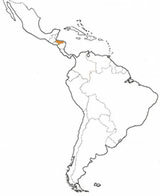 Winning its independence in 1839, Honduras immediately became a commercial “colony” of the United States, and more precisely a “colony” of the United Fruit Company. The creation of a national army was slow to develop, owing to the extreme political turbulence which characterized the first hundred years of the country’s history. Until the end of the First World War, it would be an exaggeration to speak of a real military in Honduras. In 1903 a military academy was established, with a Chilean colonel assuming the responsibility for its direction. By 1906 an artillery school had been set up in Tegucigalpa under the direction of a former French sergeant. Surprisingly, the cadets at this school wore the German M95 Pickelhaube. 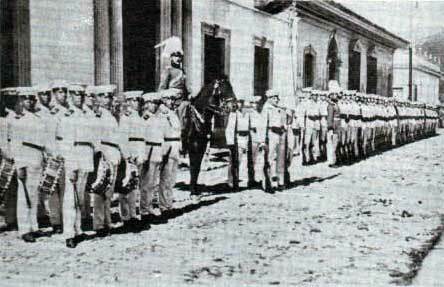 However, in general, the military institutions of Honduras functioned sporadically until the 1920s. 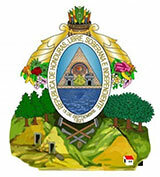 In 1933 with the rise to power of dictator, Tiburcio Carias Andino, some progress was made in the organization of the armed forces, particularly that of the Aviacion Militar Hondurena (Honduran Air Force), which proved useful in the fight against insurgents. However, with the exception of some tropical helmets worn on special occasions, no helmets appear in the photographs from this period. Toward the end of the Second World War, as elsewhere in the region, Honduras declared war on the Axis powers, and the American M1917-A1 began appearing in the Honduran Armed Forces. These helmets were, in fact, seldom worn in action because of the climate. They retained their color of origin. In 1947, following the signing of the Inter-American Treaty of Reciprocal Assistance (Rio Treaty), the US Army began delivering to Tegucigalpa a substantial quantity of military equipment, including various models of the US M1. These new helmets were immediately introduced into all branches of the Honduran Armed Forces. They were often decorated with frontal emblems, indicating the rank of the bearer. More generally, different markings were applied to the liners of these helmets, particularly by the Air Force, the Navy, the Red Cross, etc. During the 1965 Santo Domingo operations in which Honduras took part, the letters OEA (Organization of American States in Spanish) were stenciled on the right side of the M1 helmets. The Guardia Civil (Honduran military police), which has and continues to play an important role in the “pacification” of the country, uses the same helmets as the Army. In the 1970s, anxious to modernize its forces, Tegucigalpa acquired an important quantity of Israeli OR-201 helmets. This type of headgear was chiefly used by special forces and paratroop units. Beginning in the middle of the 1970s, the Israeli Orlite M76/85r Kevlar helmets were also introduced, and since the end of the 1980s, US-manufactured (Unicor) PASGT helmets have been widely distributed. The tank crews of the Honduran Armed Forces use various American models from all periods (Doughnut, Anti-crash Armored Forces, etc. ).